1 Protecting children online  How can you protect your child online?  Are you aware of the dangers? 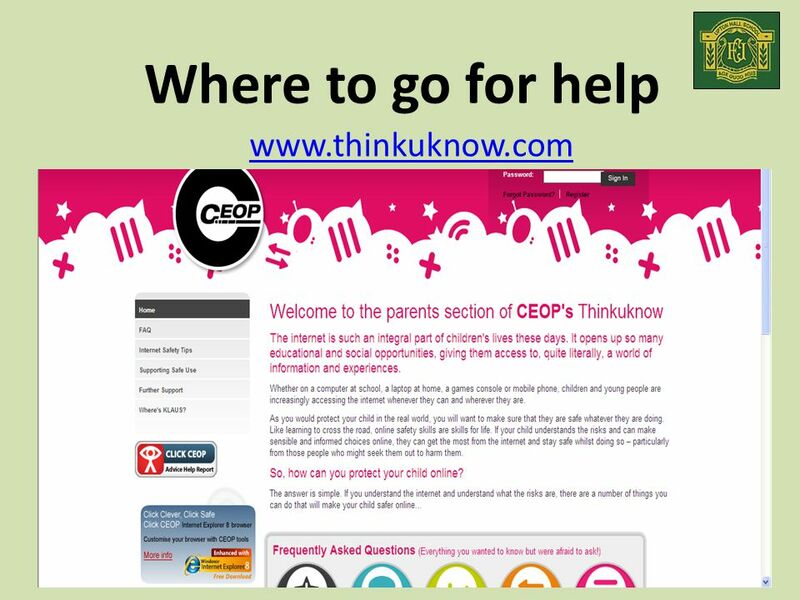  Do you know what you can put in place to protect your child? 2 Whether on a computer at school, a laptop at home, a games console or mobile phone, children and young people are increasingly accessing the internet whenever they can and wherever they are. As you would protect your child in the real world, it is important to make sure that they are safe whatever they are doing. Like learning to cross the road, online safety skills are skills for life. Where’s Klaus? Do you know what your child is doing when using the latest technology? Do you understand the technology they use? 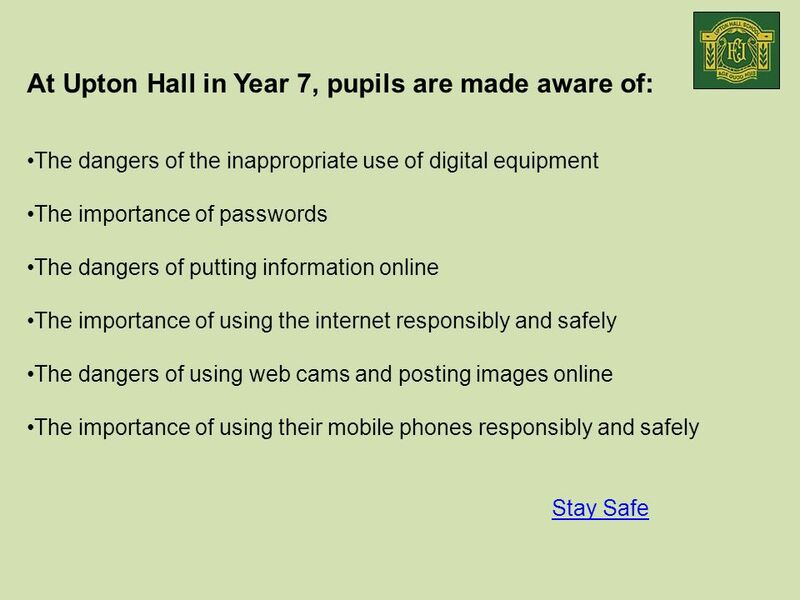 Here at Upton Hall we are urging you to work with us to ensure our pupils are made aware of the dangers of using digital equipment and how to keep themselves safe. 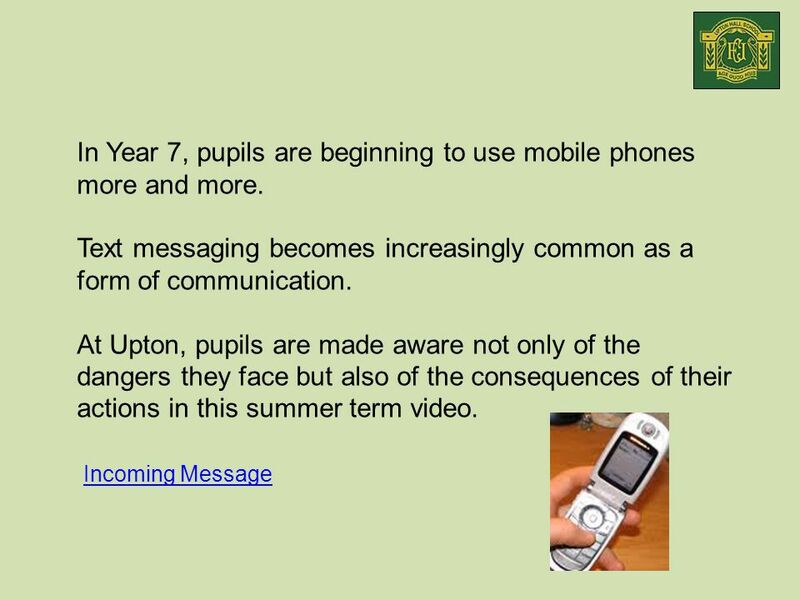 4 Incoming Message In Year 7, pupils are beginning to use mobile phones more and more. Text messaging becomes increasingly common as a form of communication. At Upton, pupils are made aware not only of the dangers they face but also of the consequences of their actions in this summer term video. 7 Social Networking The first point on the Facebook User Policy states this: If you are under the age of 13, do not attempt to register with Facebook. 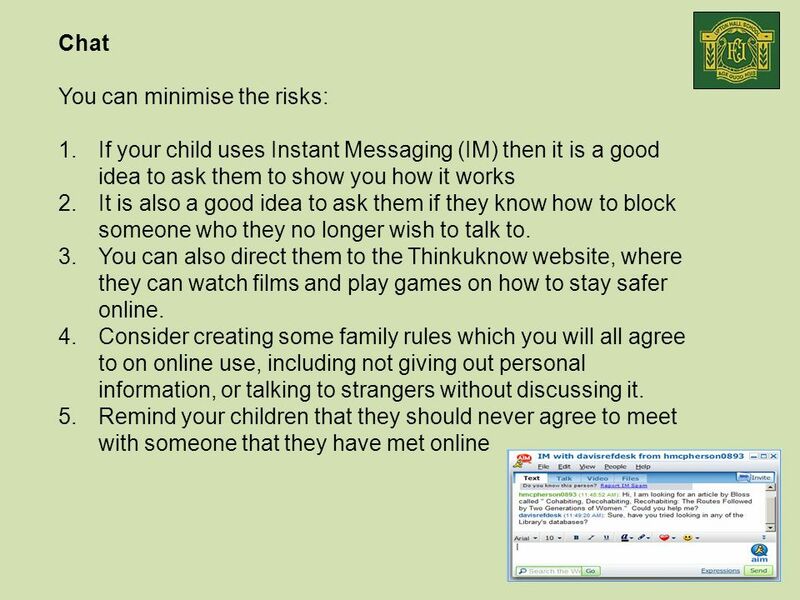 Once they are old enough to use social networking sites you need to encourage safe working habits Encourage children to only upload pictures that you as their parents/carers would be happy to see – anything that is not appropriate to be passed round the dinner table should NOT make it on to the web. It's also not a good idea to post pictures which can identify our school since this could help someone locate them. 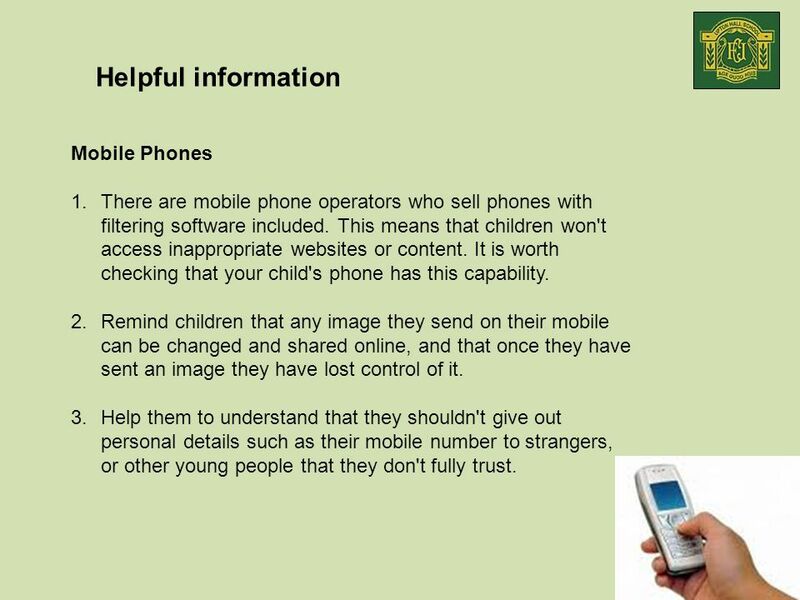 Tell your children not to post their phone number or email address on their homepage. Help your child to adjust their account settings so that only approved friends can instant message them. New people can still send them friend requests and message them, they just won't be able to pester them via Instant Messenger (IM). 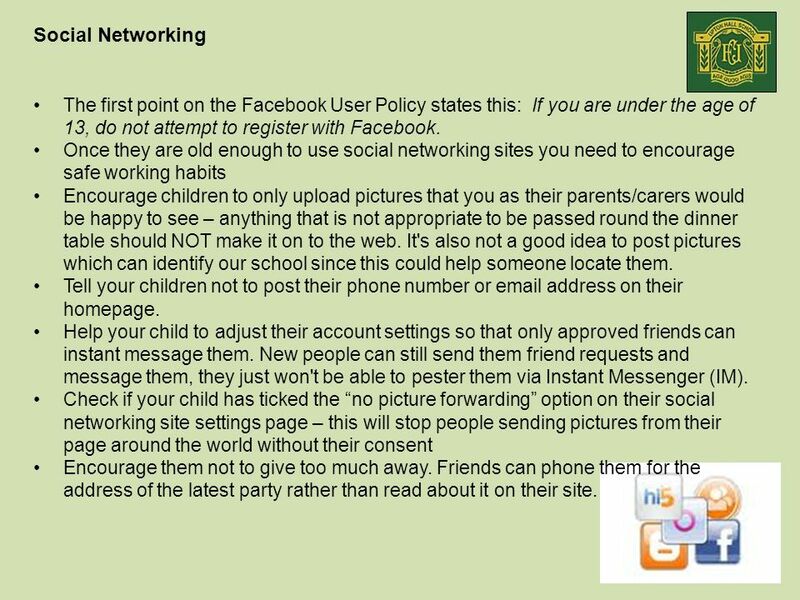 Check if your child has ticked the “no picture forwarding” option on their social networking site settings page – this will stop people sending pictures from their page around the world without their consent Encourage them not to give too much away. Friends can phone them for the address of the latest party rather than read about it on their site. 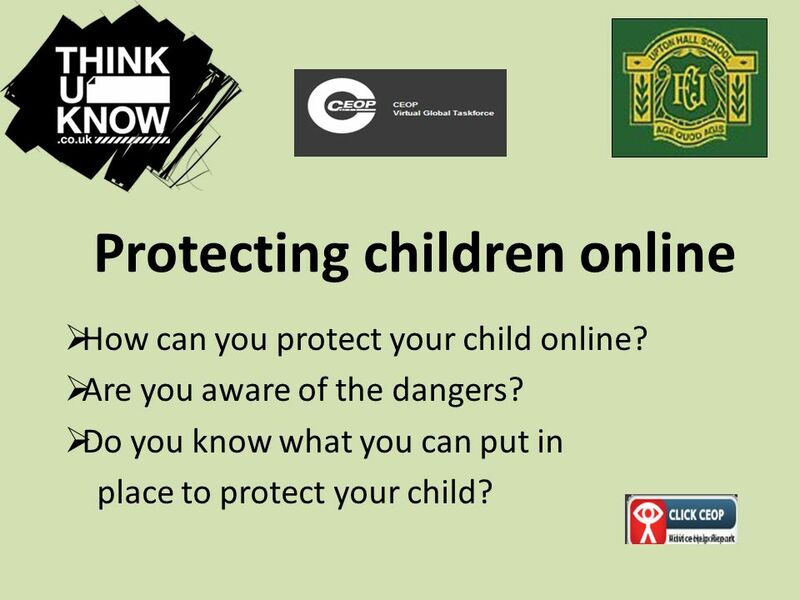 Download ppt "Protecting children online  How can you protect your child online?  Are you aware of the dangers?  Do you know what you can put in place to protect." E Safety Dorothy Stringer School. E Safety E safety is normal safety the difference is the knowledge gap. How to stay safe on the internet 5S e-safety assembly. Internet Safety. Internet use and Social networking There may be a knowledge gap between you and your children in this area. It may be an area that you. 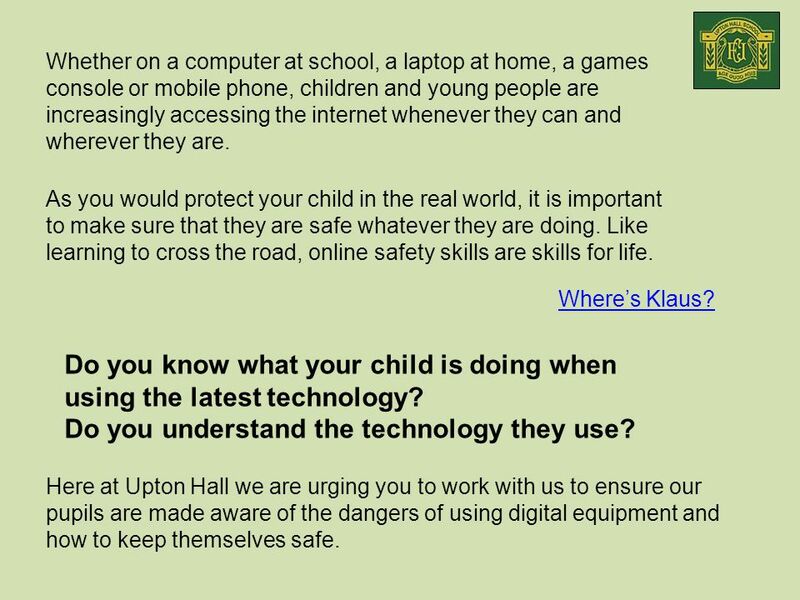 Coxheath Primary School E-safety- Term Purpose To outline the use of the internet in school The use of the internet outside school What are the. 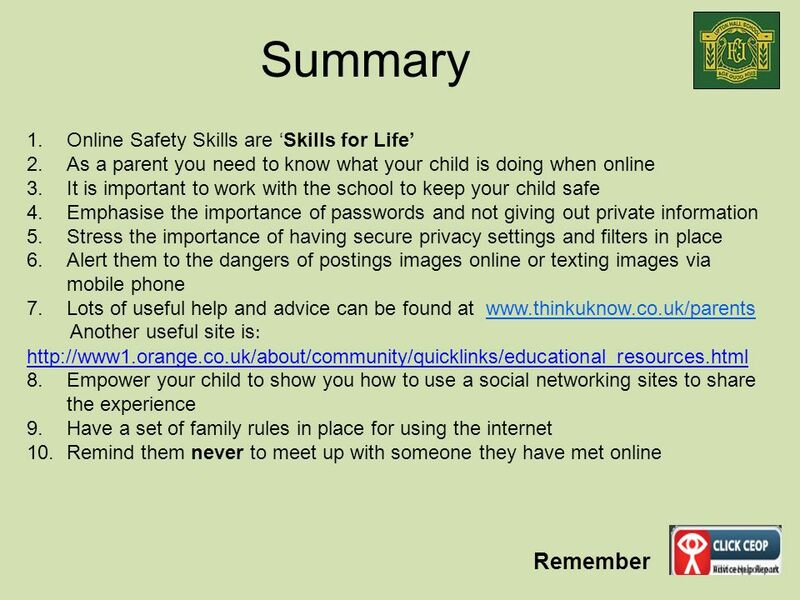 Cyber Safety What Every Parent Needs to Know If your child is surfing the Web, you need to be paddling right alongside him/her. Social networking. Social networking sites, like Facebook and MySpace, let you connect with family and friends using: blogs photos profiles internal email.